December 9, 2017 — History was in the making today as Da Vinci Schools and Wiseburn Unified School District administrators, board members, students, staff, families, community members, industry leaders, and invited guests gathered for the official Grand Opening of the Wiseburn High School facility, home of Da Vinci Communications, Da Vinci Design and Da Vinci Science. The 210,000 square foot ‘hyper-adaptable’ main building was designed by Gensler to resemble a creative workspace. Each school occupies one floor. Da Vinci Science is housed on the second floor, Da Vinci Communications on the third floor, and Da Vinci Design on top. Da Vinci and Wiseburn administrative offices occupy the first floor. It was a spectacular day of celebration featuring speeches, check presentations, a ribbon cutting ceremony, and music performances by the Wiseburn-Da Vinci Jazz Ensemble. Hundreds of attendees toured the campus after the ceremony, which included remarks from El Segundo Mayor Suzanne Fuentes, Wiseburn Unified Board President Israel Mora, Da Vinci Schools Board President Chet Pipkin, Wiseburn Superintendent Tom Johnstone, Da Vinci CEO Matthew Wunder, Gensler Co-CEO Andy Cohen, Balfour Beatty VP John Bernardy, and educational leader Marshall Tuck, among others. 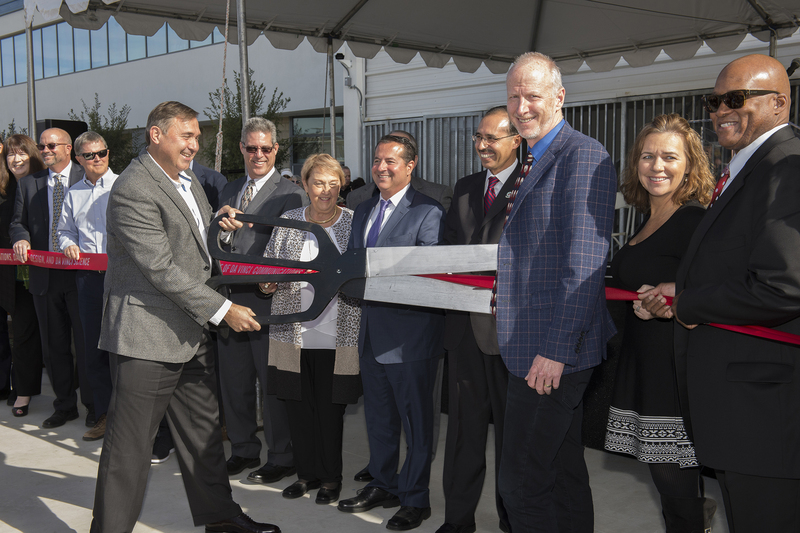 In an unprecedented district-charter partnership, this project has succeeded through a creative alliance of local Wiseburn bond funds ($87M); a charter facilities grant match ($52.7M); generous corporate and foundation giving; and strong local support from the Wiseburn community and the City of El Segundo. We are enormously grateful to our Capital Campaign donors to date, including: Belkin International, the Pipkin Charitable Foundation, Northrop Grumman, Chevron, Continental Development, The Boeing Company, The Ralph M. Parsons Foundation, the Ahmanson Foundation, The John H. and Cynthia Lee Smet Foundation, Balfour Beatty Construction, Wiseburn Education Foundation, Vincent and Erica DiBona, Bob Tarnofsky, Art Sida, Erika Lieser, Willis Chang, and the Da Vinci Board of Trustees. Phase 2 (the athletic field, gymnasium and pool) is expected to be completed by Fall 2018.